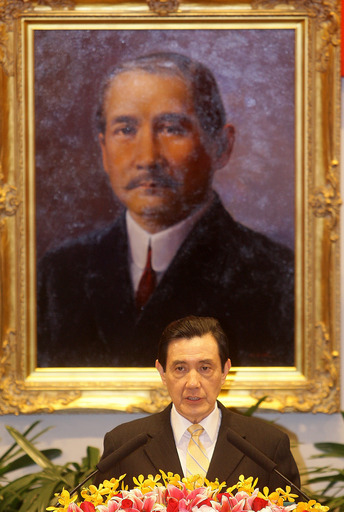 Taipei, Jan. 1 (CNA) In his New Year's Day speech delivered Tuesday, President Ma Ying-jeou pledged to speed up reforms and take measures to tackle four difficult challenges facing the country. Ma said at a New Year's Day gathering in the Presidential Office that with the sluggish economy showing its first signs of recovery, innovative steps will be taken to meet the four challenges head-on. He outlined the four challenges as intensifying global industrial competition; the acceleration of the formation of a regional free-trade bloc; the mismatch between the training of students and the actual needs of local industries; and the impact of a low birthrate and an aging population on the country's pension systems. Today marks the beginning of the 102nd year since the Republic of China's founding. Looking back on 2012, a sluggish global economy posed serious challenges. I want to say to everyone: Thank you for toughing it out! It is your efforts that have gotten us through this difficult year. The global economy is now beginning to show the first signs of a recovery. In the year ahead, Taiwan's economy will definitely perform better than last year. And now that the economy is recovering, it is all the more incumbent upon us to make the most of this opportunity to speed reforms. We must take strong measures to meet four very difficult challenges, which I intend to describe in this address. The first challenge we face is that global industrial competition is growing more intense. In the past, our high-tech sector focused on electronics and information and communications technology products, and was dependent upon expensive foreign patent licenses for key technologies. Even so, we built a highly efficient OEM system made successful by excellent quality control and cost control measures, and became an important link in the global supply chain. But the vicissitudes of the global economic climate have generated increasingly fierce international competition in the industrial sector. Taiwan's OEM model is now faced with serious difficulty. The second challenge is the accelerating formation of a regional free-trade bloc. Talks on the ASEAN-led Regional Comprehensive Economic Partnership will begin early this year. The plan is to create the largest free-trade bloc in the world, covering a region that is home to more than three billion people and accounts for more than a quarter of global GDP. In addition, mainland China, Japan, and South Korea will hold formal talks on the East Asia Free Trade Area in March or April of this year. The United States, meanwhile, is actively promoting the more exclusive Trans-Pacific Partnership. Our ability to take part in the process of economic integration will be a key determinant of whether Taiwan can expand its economic and trade presence. The third challenge is the clear mismatch between how we are training students and what industry is actually calling for. For a long time now, our universities have developed rapidly without achieving the close linkage that should exist between academia and the work world. This needs to change. On the one hand, the mismatch has made it difficult for people with advanced degrees to find employment, and salaries for university graduates remain stagnant. On the other hand, however, the complaint heard throughout industry is that there are simply not enough people available, whether it be advanced R&D talent or basic technologists, to fill all the jobs out there. If this mismatch between the classroom and the workplace persists, it is certain to seriously affect Taiwan's development in the future. Our fourth challenge is the effect a low birthrate and an aging population will have on our pension systems. Over the past decade and more, Taiwan's birthrate has been declining at an accelerating pace, dropping from 300,000 births per year to about 200,000. Today, an average of about three working people support one retiree or child; in 15 years, this will drop to two, creating a large burden on society. As a result, our pension systems face potentially massive funding shortfalls, and the national health insurance system may fall even farther into the red. While these problems are not now on our doorstep, the longer we wait to deal with them, the more difficult they will be to resolve. These structural difficulties have been building up for a long time now. The government must do everything it can to support workers, guide businesses, and lead the people through these trying times. I am well aware that bringing about such structural change and systemic reform is a difficult and usually thankless task. But the government will absolutely fulfill its responsibilities to everyone in this country, and to future generations. My administration will do what must be done, overcome difficulties, and lay a solid foundation for Taiwan's future growth and lasting prosperity. I would like to reiterate that, first, we must effect a structural transformation of industry in Taiwan by embracing value-added innovation. This will position the country as a major provider of key components and precision equipment in the global industrial supply chain, and make us an indispensable member of the global economic and trading system. In recent visits to various communities around the nation, I've observed a number of success stories, and seen for myself the energy and drive of our people. There is, for example, Tungpei Industrial Co., a company based in Zhongli, in Taoyuan County. It is Taiwan's largest specialist manufacturer of ball bearings, which are a key component in precision machinery. It has not only managed to end the longstanding market dominance of foreign firms in Taiwan, but also been very successful at marketing its own-brand products all over the world. Then we have Pai Lung Machinery Mill Co. Based in Ruifang in New Taipei City, it is one of the world's top three knitting machine manufacturers. The company holds hundreds of domestic and international patents, and markets its own-brand products around the globe. Meanwhile, Mosa Industrial Corp., based in Huwei in Yunlin County, ranks as the world's second-largest producer of small, high-pressure gas cylinders. It is also one of only a handful of manufacturers anywhere in the world producing automotive airbag inflators. The government has recently launched a Champion Enterprises Project to nurture outstanding small and medium-sized enterprises such as these, which control key technologies and are highly competitive in the global market. These firms may not be household names, but they are the true "hidden champions" of Taiwan's economy. In the future, the government's industrial policy must concentrate on boosting local employment and increasing people's incomes. For our policy to attract more foreign investment, we need to break free from traditional approaches, which are over-reliant on tax breaks and low labor costs. Instead, we must bring about an open and friendly business environment, and build advanced and comprehensive infrastructure in order to create the competitive edge that will attract high value-added manufacturing and knowledge-intensive services. Take, for example, our policy of encouraging Taiwanese businesses to return to Taiwan. The emphasis should be on helping them gain a competitive advantage by manufacturing products here. These advantages should stem from value-added innovation, rather than from lower salaries or taxes. And under no circumstances should the environment be sacrificed while seeking these ends. Second, we have to rid ourselves of protectionist thinking and steer Taiwan in the direction of gradually becoming a free-trade island. Even as we establish "free economic demonstration zones," we will also work to make inroads into emerging markets on fair and reciprocal terms. Today, Singapore has already signed free-trade agreements with most of its trading partners. Consequently, most of its exports qualify for tariff-free access to those markets. South Korea, one of our main trade competitors, is also actively discussing and signing free-trade agreements with its trading partners. As a result, South Korean exports enjoy tariff advantages over ours. We lag far behind on this front. Taiwan has got to close the gap if its industries are to compete on an equal footing. Opening up an economy can help with its structural transformation and create new trade opportunities. However, this invariably comes at a price. Although certain sectors that have long enjoyed protection will be negatively affected, the government will assist them during the transition. Those sectors that do manage to adjust will be in much better shape as a result, while those that shy away from the competition will only grow weaker. I firmly believe that, given the flexibility and innovative ability of our industries, we can revive Taiwan's economy and ensure its sustainable development. Third, we have to reshape Taiwan's system of technological research and development, strengthen cooperation between industry and academia, and enable educational institutions to play a substantial supporting role in industrial technology R&D. Porite Taiwan, located in Miaoli County's Zhunan Township, offers a fine example of what can be achieved. The oil-impregnated bearings for micro-motors that the company produces rank number one in the world in terms of both output value and output volume. The company works with universities, which provide tailor-made courses taught by the company's general manager and other senior executives. This gives students much-needed engineering skills, as well as a clear grasp of what industry requires. At the same time, the approach also helps the company recruit highly skilled technology professionals. To effectively address the challenge, the National Science Council, Ministry of Economic Affairs, and Ministry of Education have launched two related industry-academia alliance projects to narrow the gap between theory, training, and practical application. In addition, we must also spur transformation and development of our universities. We must change the way they are evaluated, so they can develop their own distinctive characteristics. We want to eliminate the wrong-headed idea that all universities should, by default, aim to secure a world ranking and publish research papers in academic journals. Rather, universities should develop their own strengths, and adopt appropriate development strategies to address such matters as research, teaching, and the dissemination of practical skills. They must maintain close connections with society, and help build up ties between academia, research institutes, and industry, to fulfill their responsibility to lead society. This must be done to make Taiwan more competitive overall. Fourth, we must promote the reform of pension systems in a manner that recognizes that we are all in this together. Taiwan is our home. We all share a common destiny. We need to foster tolerance, understanding, cooperation, and mutual assistance. The strong must help the weak. Each generation must help the one coming after it. This is the true spirit of sustainable development. For years, our pension systems have been plagued by inadequate funding and an uneven distribution of benefits among different professions and age brackets of recipients. We aim to enact comprehensive, pragmatic, incremental, and transparent improvements to our pension systems, so as to make them fairer and ensure that the needs of future generations are even better served. The 23 million people of Taiwan, regardless of status, location, occupation, or age, are all in the same boat; we must rely on one another through thick and thin, sharing the bad as well as the good. Four years ago, we were hit hard by the global financial crisis, but we weathered the storm with our "three pillars of support" policy that initiated a virtuous cycle whereby the government supported banks, banks supported businesses, and businesses supported their employees. Today, I would like to make the following request of our people: Let us refrain from meaningless confrontation, and by all means, avoid stirring up resentment among different groups. We absolutely cannot let the fabric of society continue to be ripped apart. We must immediately stop spinning our wheels, and put an end to internecine strife. The most pressing task for the government at this time is to reinvigorate the economy and rebuild people's confidence. It is clear to me that the government is the key to restoring confidence. My administration must set clearly defined policies, stick to its positions, and act decisively. It must show unshakable resolve and initiative to gain the confidence and trust of the people. This will help us create social consensus, integrate society's resources, and focus on our common goals. In this pivotal year, all government agencies must demonstrate determination and fortitude to resolve four core issues: transforming industrial structure; joining regional free trade blocs; promoting the type of R&D that meets industry needs; and reforming our pension systems. Central and local government agencies have got to break with established practices and standing conventions. They've got to take a hard look at public resources to see whether they are reasonably allocated, and whether every dollar is well spent. For any major policy with a bearing upon the people's well-being, we must plan more comprehensively, communicate better, and execute more meticulously. The government must function as a single entity; no agency should work toward its own ends. Central government agencies must end parochial behavior and proactively sell their policies to the public so as to dispel doubt and foster consensus. They must also achieve greater administrative efficiency, and their heads must show courage in carrying out their duties. I want to particularly stress that the government must work to create benefit for the people. Some civil servants have been criticized in the past for taking the attitude that "the more you do, the more mistakes you make; the less you do, the fewer mistakes you make." This is no way to make our government more effective. Starting from today, the government, from top to bottom, must abide by the principle that "the more you do, the more you can accomplish; the less you do, the less you can accomplish." As long as we operate within the bounds of the law, we should not fear serving the interests of the people; we should be committed to taking actions that benefit the people and the nation. We will thoroughly review and revise unreasonable laws and regulations. There are some which govern accounting and procurement, for example, that need to be amended. This is the only way to make it so that civil servants not only have a proactive attitude toward their work, but also have the ability and flexibility to resolve people's problems. As to the scope and effectiveness of deregulatory measures, the Executive Yuan and its subordinate ministries and agencies must thoroughly implement policies and conduct regular reviews of their performance. In the face of drastic political and economic changes taking place around the world, all public servants must have a sense of mission and, even more so, a sense of crisis, and urgency. They should work as one and give their all. My administration absolutely must show resolute determination and take decisive action in order to revitalize the economy and rebuild people's confidence. Cross-strait peace is one of the keys to peace in the Asia-Pacific region, and a prerequisite for economic development and increased willingness to invest. The past four-and-a-half years have shown that improving cross-strait relations and gaining expanded room for maneuver in the international community go hand-in-hand. In the future, the ROC will continue to play a constructive role in the promotion of peace and prosperity in East Asia. As for our relations with other parts of the world, we have always treasured our long-term friendship with the United States. We therefore were pleased that President Obama chose to visit Asia right after his re-election, and that Washington has continued to play a key role in maintaining security and order in East Asia. We intend to move up the date for a resumption of negotiations with the US under our Trade and Investment Framework Agreement (TIFA) in order to expand and deepen the bilateral economic and trade relationship. Regarding recent disputes over the Diaoyutai Islets, Taiwan recently proposed the East China Sea Peace Initiative, urging all parties to shelve disputes over sovereignty and promote the joint exploration of resources, thereby making the East China Sea a sea of peace and cooperation. The fishing negotiations currently underway between the ROC and Japan represent an important first step. We look forward to working with the new leaders of mainland China, Japan, and South Korea to ease tensions so that economic cooperation will once again be the main focus of relations in East Asia, as it should be. I also hope to cooperate with the new leader of mainland China, Mr. Xi Jinping, in continuing to promote peaceful development across the Taiwan Strait on the basis of the "1992 Consensus," whereby each side acknowledges the existence of "one China" but maintains its own interpretation of what that means. We intend to accelerate the pace of follow-up negotiations under the Economic Cooperation Framework Agreement (ECFA) in order to expand and deepen all aspects of cross-strait ties. We will also seek to further loosen restrictions on investments from mainland China, and will further open our borders to mainland students and free independent travelers. To this end, we will soon begin a comprehensive review of the "Act Governing Relations between the People of the Taiwan Area and the Mainland Area" and amend it to eliminate certain out-of-date restrictions and discriminatory provisions. In addition, we will promote the establishment of administrative offices in each other's territory so as to better serve the needs of the several million people who travel across the Taiwan Strait each year. This will also lay a stronger foundation for the institutionalization of peaceful cross-strait ties. The people of the two sides of the Taiwan Strait are all ethnic Chinese. We are all descended from the legendary Emperors Yan and Huang. Therefore, the leaders of the two sides should always keep long-term peace across the Taiwan Strait as a top priority. The further institutionalization of cross-strait ties fosters deeper understanding between our people and consolidates cross-strait peace. This goal is always uppermost in mind for me, and I pursue it with every means at my disposal. Over the past few years, I have traveled throughout Taiwan and witnessed many moving success stories built on the creativity, determination, and concerted efforts of the people of Taiwan. In Wuqi District of Taichung City, for instance, I learned how Taiwan Hon Chuan Enterprise has slashed its transportation and packaging costs by relocating its production lines to clients' plants. This has helped it become the largest supplier of food and drink packaging in Taiwan. In Yunlin County's Lunbei Township, Sing Chang Koi Farm has transformed Taiwan's ornamental carp into high-value living "works of art," exporting them all over the world. In Meinong Community of Taitung County, young adults who returned to the land of their youth to take up farming have developed the unique atemoya ice cream. This dessert is made of locally grown atemoya, also known as the "pineapple sugar-apple." This is now one of the desserts we present at state banquets. In Tainan City's Sinying District, Gloria Material Technology Corporation provides the global aviation, aerospace, and energy industries with special steels. Through customization, its products have become indispensible to clients. The firm ranks among the top 10 in the world in its field in terms of market share. All of these success stories represent the fruits of the government's new approach to the task of spurring recovery in the industrial sector, namely, incorporating a service element into manufacturing, and promoting the emergence of distinctive traditional industries. Here in Taiwan, our home, I have been touched and filled with hope by the hard-working and enterprising ways of the people, the vitality of the private sector, the creativity of younger generations, and the ambition of our small and medium-sized enterprises. I believe it is precisely this vitality, creativity, and ambition that will enable us to reinvigorate Taiwan's economy. My compatriots, this past year was a difficult one for all of us. Yet together, we overcame setbacks and realized outstanding achievements. For instance, the number of travelers visiting Taiwan from abroad exceeded the seven million mark, a new record that tops the figure from four-and-a-half years earlier by 88%; and the number of jurisdictions granting visa waivers or landing visas to Republic of China passport holders jumped to 131, up by a factor of 2.5 from four-and-a-half years ago. Quite clearly, the international community now holds a more friendly and positive attitude toward Taiwan. Our success has not come easily, but this reminds us never to underestimate the resilience of our people. My fellow citizens, please rest assured that no matter how difficult and hazardous the world may be, as long as we remain confident, work as one, seek reform, and skillfully marshal the forces of progress, we can surely achieve positive things and create a new future for the Chinese society. With the advent of the New Year, I would like to wish all of you good health, peace, and happiness. May all that you hope for come to pass.